According to the Sunday Times story, naval psychologist Lt. Comdr. Thomas Narut was assigned to the U.S. Regional Medical Center at Naples, Italy. When he first made public the navy's part in programming assassins, he was attending a NATO conference in Oslo on "Dimensions of Stress and Anxiety." In attendance at that conference were 120 psychologists of all descriptions and from many countries. Many of them were involved in research on how to improve man's ability to cope with stress, but none of them felt compelled, as Narut did, to discuss their work so fully or so frankly. The stated objective of the conference was to exchange information on how soldiers and people in difficult jobs could cope with stress. Dr. Narut's talk was on "The Use of a Symbolic Model and Verbal Intervention in Inducing and Reducing Stress." His speech began with a plug for the navy. He knew, he said, that many of the scientists present had often encountered problems in their purely scientific research because of the military's inclination to research that would yield quick and useful results. He sympathized with those who had trouble getting subjects, funds, or both, out of the military for their purely scientific research. But things were different in the navy he said. In the navy, Narut bragged, there were plenty of captive personnel who could be used as guinea pigs. In the navy there was a computerized record of each man's background and psychological profile, so that a quick selection of men with suitable psychological inclinations for experiments could be made. Navy psychologists not only had access to computerized records, but also to psychological tests and background data on a large number of people. 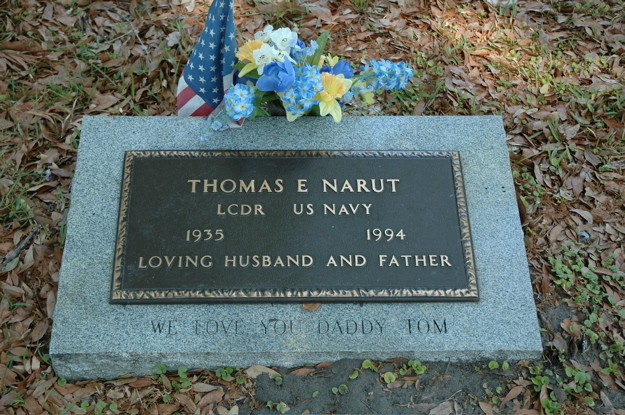 In the navy, Narut said, funds were plentiful, and there were no problems with transporting subjects for study to nearly any place in the world. Narut stated proudly that the U.S. Navy provided scientists with the most advanced research facilities in the world. - Join the navy and study the world". In his brief discourse, Dr. Narut did no more than hint at the work he had been doing in teaching "combat readiness units" to cope with the stress of killing. Later, however, during private questioning with a small group of listeners (reporter Peter Watson of the Sunday Times, a former psychologist, among them), Narut unfolded the amazing story of the navy's programming of assassins on an assembly-line basis. In his mid-thirties, Dr. Narut had just completed his doctoral dissertation on the question of whether certain films provoke anxiety, and whether forcing a man to do irrelevant tasks while watching violent films would help him cope with the anxiety they produced. When pressed by Watson to explain the details of this kind of conditioning, Narut said that he had worked with "combat readiness units" which included men being programmed for commando-type operations and for undercover placement at U.S. embassies. These, Narut said, were "hit men and assassins" (Narut's words) made ready to kill in selected countries should the need arise. Dr. Alfred Zitani, an American delegate to the conference, was very surprised by Narut's disclosure. "Do you think Dr. Narut realizes what he has just said?" Zitani asked. "That kind of information must be classified." The conditioning of Narut's assassins was accomplished by audio-visual desensitization, a standard behavior modification process. These men were "desensitized" to mayhem by being shown films of people being killed or injured in a number of different ways. At first the films would show only mild forms of bloodshed. As the men became acclimated to the scenes of carnage, they would see progressively more violent scenes. The assassin candidates, Narut explained, would eventually be able to dissociate any feelings they might have from even the goriest scenes they viewed. Narut said that of course U.S. naval psychologists would have first selected the candidates for training by their psychological makeup. Those selected for assassination assignments were often from submarine crews and paratroops. Others were convicted murderers from military prisons who had already shown a proclivity for violence. Still others were men who had been given awards for valor. World War II Medal of Honor winner Audie Murphy was a subject of extensive research. The best killers, according to Narut, were men whom psychologists would classify as "passive-aggressive" personalities. These were people with strong drives that were usually kept under tight control. Such types were usually calm, but from time to time would exhibit outbursts of temper during which they could literally kill without remorse. Narut said that through psychological testing, he and his colleagues were looking for more such men, for further conditioning. Among the tests used by the navy to determine violent natures was the Minnesota Multiphasic Personality Inventory, which is used widely by educators and businessmen to determine psychological qualities of students and employees. The tests consist of hundreds of questions designed to measure such personality traits as hostility, depression, and psychopathy. 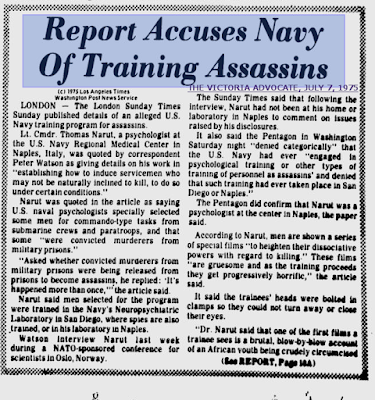 According to Narut, the men selected by the tests, or by evidence of past violence, were taken for programming to the navy's neuropsychiatric laboratory in San Diego, California, or to the Naples medical center which employed Dr. Narut. Audio-visual desensitization was the major technique used in programming the assassins. Psychological indoctrination completed the programming by instilling the desired prejudicial attitudes. The audio-visual desensitization began with the subject strapped into a chair with his head clamped so that he could not look away from the screen. A special mechanism prevented the subject's eyelids from closing. The candidate was then shown a film of an African youth being crudely circumcised by fellow members of his tribe. The youth was circumcised with a blunt knife, painfully and without anesthetic. This well-known film is used widely in psychological experiments to create stress. Afterwards the candidate was asked about details of what he had seen. He was asked, for example, to describe the color of the belt on the doctor's trousers, or the motif on the handle of the knife that cut off the foreskin. The next film showed a man in a sawmill, where planks were sliced from huge logs. In the operation of the saw the man slipped and cut off his fingers. As the films progressed in gruesomeness, the reactions of the candidate were measured by sensing devices. Heartbeat, breathing rate, and brain waves were recorded, very much as on a polygraph. If the physiological responses, which might have been great in the beginning, slowed down and resumed normal patterns as the more bloodthirsty scenes were viewed, the candidates were judged to have completed this stage of conditioning. The last phase of conditioning, Narut said, was to indoctrinate the candidates to think of their potential enemies as inferior forms of life. By this stage, the candidates would have already been selected for assignment to particular countries. They would be shown films and given lectures which portrayed the customs and cultural habits of the foreign countries in a biased fashion. The people of those countries would be portrayed as enemies of the United States and were always spoken of in demeaning terms. They were often presented as if they were "less than human." Their customs were ridiculed, and local leaders were presented as evil demagogues, even if they were legitimate political figures. 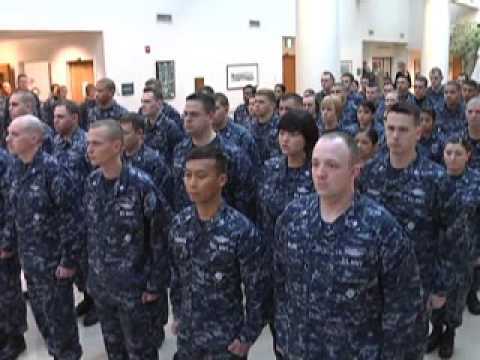 Naval Hospital Naples Corpsman Awarded Bronze Star, but they doesn't look proud or even glad. According to Dr. Narut it took only a few weeks to indoctrinate susceptible candidates by this process. Those who were not susceptible to the conditioning were dropped earlier in the program and returned to other assignments. Narut admitted that he did not have the necessary "need to know" as to where all the programmed men were sent, although at one point in his conversation with Peter Watson, Narut specified that programmed assassins have been installed in the Athens embassy. He said that his busiest time was when a large group of men went through such training towards the end of 1973, at the time of the Yom Kippur War. After the Oslo conference interview, Watson returned to London to file his story. Writing up the details, he found a few points which needed clarification but he could not reach Narut either at his home or in his laboratory in Naples. Watson then asked the U.S. embassy in London to comment on the information Narut had volunteered. The embassy passed the buck to the U.S. Navy. 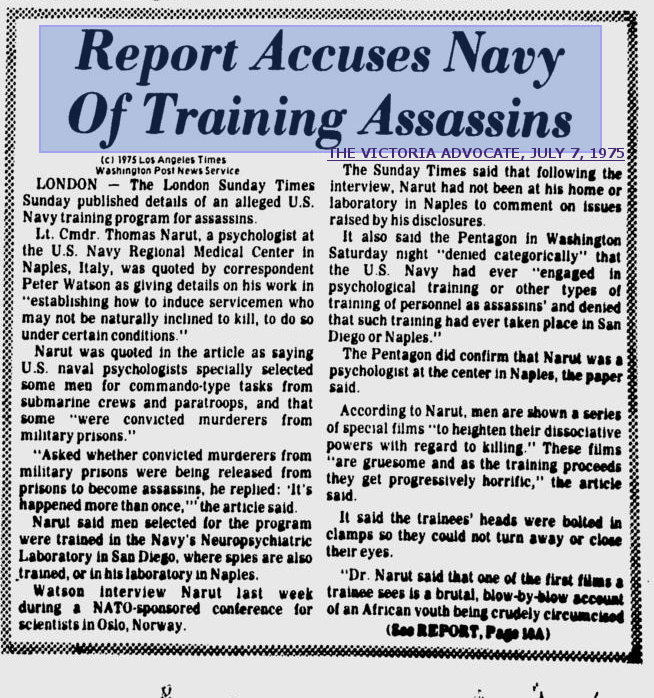 Within a few days the Pentagon issued a categorical denial that the U.S. Navy had ever "engaged in psychological training or other types of training of personnel as assassins. "They also denied that any such training had ever taken place either in San Diego or in Naples. They said they too had been unable to contact Lieutenant Commander Narut, but they did confirm that he was on the staff of the U.S. Regional Medical Center in Naples as a psychologist. But Dr. Zitani later offered to testify about what Narut had told him to appropriate authorities." Watson was also approached later by a psychologist in Los Angeles who said he had seen the Pentagon denials so thought Watson would like to know that he had lent the San Diego psychologists a copy of his film on circumcision which was used in the desensitization conditioning. A few days later Narut was located. He flew to London to discuss the matter ostensibly with Watson's paper, the Sunday Times, but instead he held a press conference saying only that he had been talking in "theoretical and not practical terms." He then flew back to the Naples base. After his return to Naples, U.S. naval headquarters in London offered the official explanation for Narut's statement: Narut had "personal problems." A few days later Watson was able to contact Narut at the U.S. hospital in Naples, but he refused to elaborate on his disclosure. During the Oslo conference interview, Narut had said several times that what he was saying about the assassins was "coming out anyway." He was referring to the congressional disclosures about CIA assassination plots. But the fact that the navy had been operating along lines similar to the CIA was not known to the public nor has it subsequently been admitted. The details of the story that Lieutenant Commander Narut related have been strongly and categorically denied in all subsequent queries of the navy. It came as no surprise to many that the navy had been interested in psychological research to help its men cope with "stress." Several years before, one of the organizers of the Oslo conference, Dr. Irwin Sarason, had been approached by the navy to work on projects similar to Narut's. At the time, the navy had said nothing to him about programming assassins; it said it wanted him to adapt his work for applications to "spies." In response to that request, Sarason devised a film which showed how successful students asked questions in school. The film was shown to a group of juvenile delinquents for a period of time until they, too, learned how to pose the right questions. As a result, over the next two years they did much better in their studies and got in trouble less. The control group who had not seen the films did just as poorly in school as they'd always done and were just as delinquent. Since his "symbolic modeling" study had been successful, Sarason wanted to continue his research and applied to the Office of Naval Research for more funding. A few weeks after his application was received, Sarason was called by a navy official who asked him if he would object to having his work classified. Sarason wondered why, and the navy official told him his research would be most valuable to the navy's neuropsychiatric laboratory in California, as spies were being trained there to resist interrogation. The naval official said that if Sarason would allow his work to be classified, he'd get all the funds he needed. But Sarason was interested in the peaceful scientific nature of his work, not its military applications, so he refused to have the project classified. His goal was the exception rather than the rule. The federal government supports most scientific research in the United States. Enough psychologists and other social scientists haven't asked questions about what their research is to be used for; their main objective has been to get the grant, so they could support themselves and their scientific curiosity. 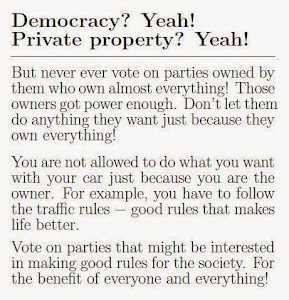 Since too many of them have been politically disinterested or naive, they have been easy prey for the cryptocracy. Lieutenant Commander Narut was therefore but one in a long line of psychologists being employed for psychological warfare and illegal clandestine operations. Another such operation was the training of security officers at the Washington-based International Police Academy by psychologists and sociologists. The officers were supposedly being taught interrogation techniques for Third World countries; actually it was a highly sensitive clandestine operation organized for the training of U.S. spies. Congress closed the Academy on January 1, 1974, after its real purpose was disclosed to the press. Det var på en NATO-konferens i Oslo 1975 som Narut gjorde sitt utspel. På Google Maps syns sjukhusbyggnaden (c:a 100 m x 100 m) mitt i ett gigantiskt inhägnat område kallat U.S. Naval Support Activity Center (1 km x 1 km). Alldeles söder om själva sjukhuset syns en byggnad som ser ut som en stor fängelsebyggnad och med lite fantasi kan man ana underjordiska gångar mellan byggnaderna. Från Street View syns nedan sjukhuset och "fängelset".